The Google Cash Pump System is the ONLY system that will teach you how to get huge amounts of traffic and inbound links to your website. What my secret method will do is help you learn how to pump traffic to your website on a consistent basis, while also developing inbound links, of which Google loves. When Google indexes your site, they will notice your inbound links and will bump your website up in the search results resulting in higher page ranks! The first step in the traffic pumping system is to create a set of highly targeted keywords and phrases that apply to your product and niche. This step shows how this is done. In this section, you get to see exactly how to create this highly targeted list of keywords using free Google tools as well a few others that don't cost you a single penny! This is a very important step most online marketers tend to skip over quickly and suffer huge losses in profits. But you will learn how to avoid this mistake forcing you into profit from the start! This is what no one really knows how to do. In this step you will see how to construct traffic pumping keyword combinations formatted into powerful questions designed specifically to siphon massive traffic fast! In fact, many online marketers don't realize the power of questions! Strategically designed questions that contain your top keywords or keyword phrases can be extremely effective when it comes to driving massive traffic to your websites in record time! But, most importantly, these questions are also designed to attract laser targeted traffic of potential buyers that are looking for the exact solution your product or service can provide the solution for! If you do not have a Gmail account, this step will show you how to do it. This may seem like a very trivial step in this system, but in fact, it's the most important! This is where your traffic hub starts as well as where you will be receiving your new lead information. 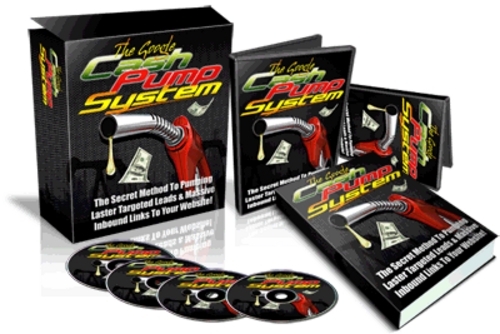 With this step you will learn how to get your traffic pump flowing. This step takes your new Gmail account to the next level. Many new-comers to online marketing don't realize how many free and VERY powerful tools that Google provides. Google Alerts are no exception. In this step you see how to setup your Google Alerts to pump laser targeted leads from the Google search index into your traffic funnel and ultimately to your web sites and/or services! With this step, you will be shown how to maximize the return on your results so the work you did previous will give you top results. In other words, this step ties it all together forming a constant gushing pump of new fresh targeted leads into your online business in mere minutes! In video 1 you get to see exactly how to quickly build a large list of laser targeted keywords required to siphon massive traffic from Google using FREE tools only! HINT: You will learn more than just the basic Google Keyword tool that everyone uses! There are other hidden Google tools that many online marketers don't even know exist! This simple but powerful method will seed your traffic into hyper drive! You will see how to format your laser targeted keywords into traffic pumping questions guaranteed to bring in the exact traffic your online business requires for maximum profits! This quick and simple video will show you how to setup your new Gmail account for huge traffic action! Plus, you get to witness a real live account that has been collecting laser targeted leads ready to take action! This is truly on of the most important steps and formulates the hub of this super-effective and powerful system. You also get to see exactly how this works using the example explained in the system ebook. In this final step you see how the real magic works and get to witness the true power of this system. Here is where you put everything together to build one of the most successful systems guaranteed to drive targeted & hungry buyers to your online business. This was a last-minute addition to this bonus package, but a valuable resource for dramatically increasing your website conversions. This video covers 2 very important and super-powerful methods that re-pump lost traffic back into your websites that you would have normally lost! This involves cutting-edge new technology that most online marketers don't use. To be honest, most online marketers or product owners don't realize how much traffic they are losing right now! Did you know that you lose 95 of your website traffic within the first 5 to 7 seconds that people arrive at your website? This video shows you how to re-pump ALL 95 of that LOST traffic back into your product funnel. In most cases this can result in a 300 increase in sales! The information presented in this video has the potential to make back the cost of this entire product 10 over in as little as 3 days! Learn 21 of my closely guarded quick-tricks proven to increase sales time and time again across multiple markets Are you failing to test "what works" & "what doesn't work"? ... Testing has been proven to be the MOST powerful part of marketing since the beginning of the internet! Don't throw away your valuable time and sacrifice sales with extensive testing ... instead, simply borrow my proven results to instantly boost your website conversions! Product Flipping For Cash, Mrr Included!